Before anybody gets excited, it isn’t a another ‘new’ job. And no, I’m not getting married again. Nothing quite that monumental. Obviously, there are writers, bloggers, websites that have 10,000 hits per day–and get millions on a yearly, or monthly basis. I know that. And yet, I feel a sense of accomplishment. When I look at my stats, there visitors from all over the world. Not only do I have a ‘nice’ group of followers (27, last time I looked), there are also many who use RSS feeds, bookmarks, Facebook and other tools to keep up with my posts. And they do so regularly. To everybody who has stopped by…my most sincere thank you. I appreciate the comments, personal emails, texts and other communications. I truly do…. But I do love to write. Love that I can make a difference. Can share some of my thoughts and experiences (AND disasters and struggles) in an honest, positive way. And hopefully others feel a little more human, less alone. LENGTH ~ I am going to try (HARD) to shorten my posts. Writing the longer ones is time-consuming. (And I fear boring?) Plus I need to focus on getting a ‘real’ job–at least a part-time ‘real’ job. (And soon!) 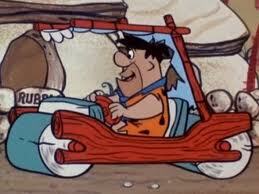 Unless I want to make like Fred Flintstone and drive a log car, using my FEET to get it going. THEME ~ I have playing around with it. It will probably change soon. Don’t be alarmed, or think you are in the wrong place if the site has a ‘new’ look. A BIG THANK YOU–And all of my gratitude to those who have hung in there and supported me these past couple of years. This entry was posted in Social Networking, The best laid plans..., The other Side of 40 and tagged Failure, life plans, Parenting, Setting up a Home Office by Amy Lauria. Bookmark the permalink. Congrats on the milestone and good luck with the changes. I wish I still had the link, but I stumbled upon a website (rather a blogging service) that pays for you to write. So…perhaps this could be that perfect part time job! Amy, congratulations! Your writing skills are awesome and particularly interesting. The thing I like is you address the trials/tribulations as well as positive experiences of everyday living. I am sure that somewhere among the 10,000 hits is someone who would like to increase there revenues and improve their profit margins, which could realistically be accomplished with you on their staff. Good Luck in your future endeavors!